My apologies for another unfinished page. Last week I had honestly been more exhausted from the Baltimore Comic-Con than I have been from any convention I’ve ever done. It was a great show, but it took all week to recuperate. As it was, I posted a black and white page, and this week I attempted to not only colour that page and complete this week’s page, but make some corrections to pages 55 through 57. It was a tall order (apparently). Rest assured, both pages 58 and 59 are half-coloured (you can see the evidence of that for page 59 presently), and they should be completed very soon–perhaps by the end of the day! As for the corrections to pages 55 through 57, I never did write about those pages, but at the start of Chapter II, you may have noticed I altered the art style of the book a bit. 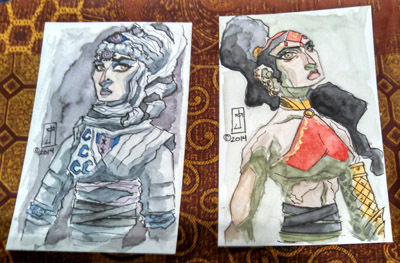 This was based upon two Chadhiyana convention sketches I created back at the Boston Comic Con in August which I love the look of (pictured above). Alas, after trying a similar style on a few pages, I realised certain elements would not work for the book (mainly, the absence of the stark blacks I use which I get so many compliments on). 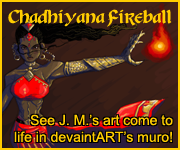 I will continue to incorporate some elements of that style, at least through this scene of the book, before I make a decision on whether they are working or not. It’s all about tweaking things to see if they better fit my vision. So when you see a change, let me know what you think in the comments section of the individual pages or on this blog. I always like hearing what my readers are thinking. 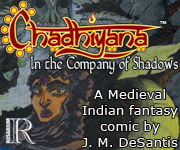 Other than that, I’m writing a script for a new Chadhiyana story (taking a break from the graphic novel for a bit). This story was planned as a two-issue mini-series, but at the time of this writing, I am thinking it might spill over into a third issue. I’m really liking this one and hoping to, even while working on this graphic novel, somehow find the time to get this mini-series out next year. Also, don’t forget that next month is the New York Comic Con at the Jacob Javits Center in New York City (October 9 – 12). I’ll be in Small Press again (not Artist Alley!) at booth 1259. I’m planning to have a few new items on the table as well as some old favourites, so if you’re going, don’t forget to add me to your show planner. Well, that’s all for now. See you next week with another page, and (likely) all of the aforementioned corrections complete.